These days it is difficult to find news headlines without mention of Facebook. Recently questioned for unlawfully allowing Cambridge Analytica to collect user data from Facebook Messenger app. All shows how Facebook is abusing user data and gathering it without their consent. In a recent disclosure, the company is shamefaced of collecting calls logs, SMS data of its users. For which Facebook has the audacity to claim, it is doing all this to make user experience better. Shocked? Well don’t be yet, as with the rate Facebook’s real face is exposed, it seems more is yet to come. Therefore, you need to be extra careful while granting any app a permission. Your one mistake may put all your phone data at risk. Facebook has confirmed that this feature is opt-in and you can disable the logging. To know more about how to do it keep reading the article. We will provide you with step by step instructions to do so. Here, you can see all the synced data. Now, that you have seen all the uploaded data, to delete it click on the Delete All button that you can find at the top. 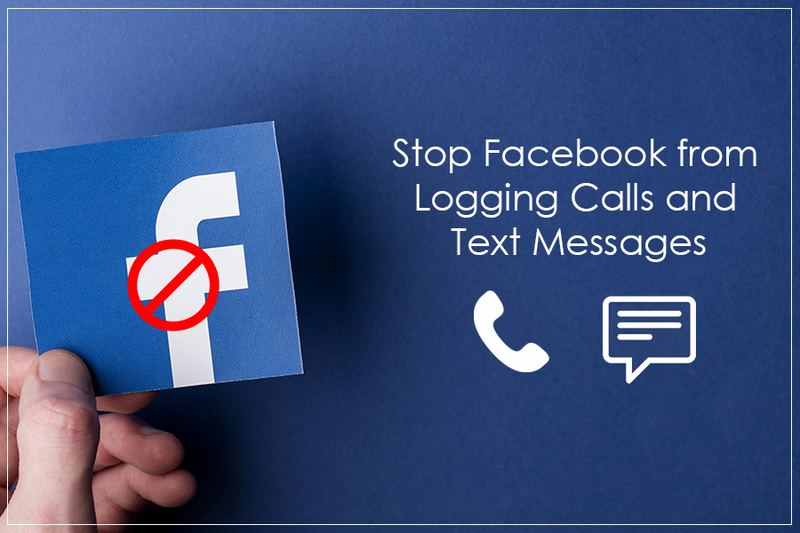 How to stop Messenger from uploading your contacts? 2. Next, tap on your profile picture in the top right corner. 3. Now scroll down to look for People, tap on it. 4. Next, tap on Sync Contacts to disable the setting off. Note: If you disable Continuous contact uploading then call and SMS uploading will automatically be disabled. 2. Next, tap on your profile picture in the top left corner. Note: Once contact uploading is disabled all uploaded contacts are automatically be deleted. Alternatively, you can go to the Manage Your Uploaded Contacts screen and tap Delete All Contacts > to delete them. 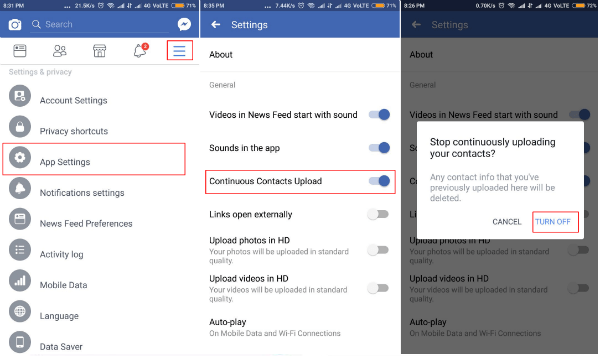 To stop contact uploading in future disable continuous contact uploading on the devices where Messenger app is used. 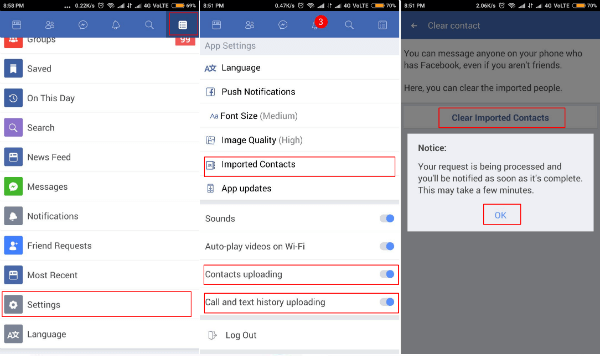 However, please note this doesn’t mean that contact uploading is disabled from the Facebook app. 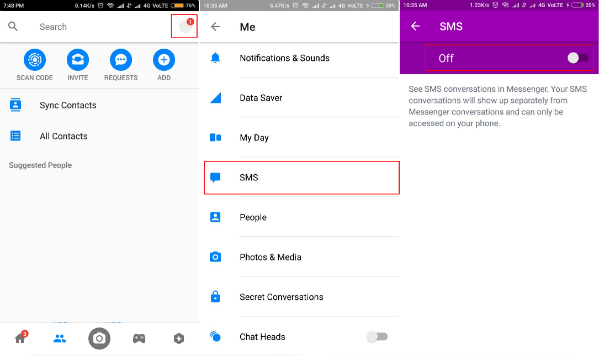 How to Limit Facebook App Permissions? 1. Go to your phone Settings and scroll down to look for Application Manager/ App permissions. 2. Now search for Facebook app > Permissions. Note: If you want to go live Facebook will ask permission to use camera and microphone, allow it and then disable later. 2. Now click on the three horizontal lines at the top right corner and scroll down to look for ‘App Settings’. 3. Here, toggle off the option ‘Continuous Contacts Upload ‘. You will receive a pop up mentioning “Any contacts info that you’ve previously uploaded here will be deleted” tap on ‘TURN OFF ‘to disable it. 1. Go to the Menu > scroll down to search for ‘Settings’ Select it. 2. Here, you need to do certain things. (a) Toggle off the ‘Contacts uploading’ and ‘Call and text history uploading’. (b) Now select ‘Imported Contacts’ and tap on ‘Clear Imported Contacts’ and tap ‘OK’. 2. Now scroll down to look for ‘SMS‘. 1. Head to the profile tab and select ‘People‘. 2. 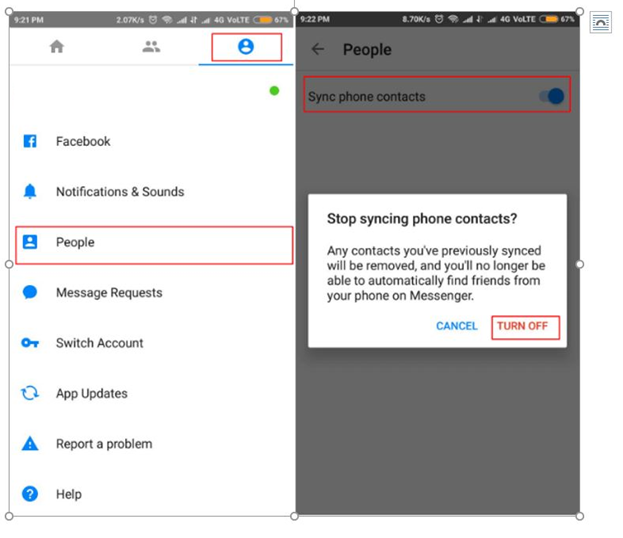 Now toggle off ‘Sync Phone Contacts‘. A confirmation dialog box will appear mentioning ‘all your previously synced contacts will be removed’ will display and select ‘TURN OFF‘. Data mining is collection is nothing new to us, but the way Facebook is collecting data is coming as a shock. The most trusted app is following wrong practices to collect data and then saying all this is done for giving user a better experience. By saying such thing how can the company think that whatever they are doing is correct. It is only us who allow all such things to happen if we keep our eyes open no one can steal our data. Therefore, we need to act now rather than to regret later.